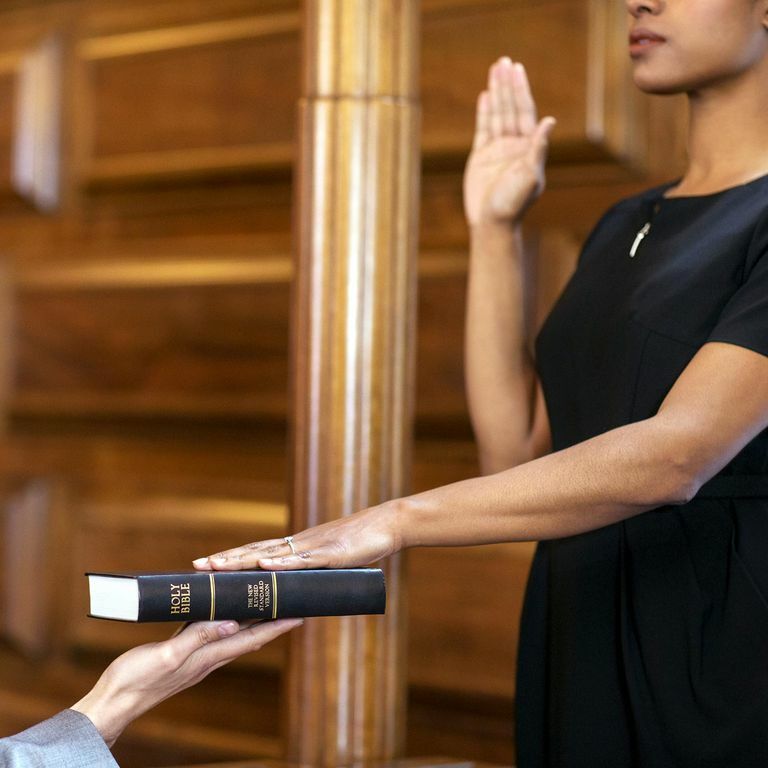 Swearing an Oath in Court. This commandment is somewhat unusual among those supposedly given out by to the Hebrews: whereas other commandments probably had shorter versions that were later added to, this one has a slightly longer format that tends to be shortened by the majority of Christians today. Most of the time when people cite it or list it, they use only the first six words: Thou shalt not bear false witness. Leaving off the ending, "against thy neighbor," isnt necessarily a problem, but it does avoid difficult questions about just who qualifies as ones neighbor and who doesn't. One might, for example, plausibly argue that only ones kinsmen, co-religionists, or fellow countrymen qualify as neighbors, thus justifying bearing false witness against non-relatives, people of a different religion, people of a different nation, or people of a different ethnicity. Then there is the question of just what bearing false witness is supposed to entail. It seems as though the concept of "false witness" might have been originally intended to prohibit nothing more than lying in a court of law. For the ancient Hebrews, anyone caught lying during their testimony could be forced to submit to whatever punishment would have been imposed upon the accused - even including death. It must be remembered that the legal system of the time didn't include a position of official state prosecutor. In effect, anyone coming forward to accuse someone of a crime and bear witness against them served as prosecutor for the people. Such an understanding is definitely accepted today, but only in the context of a much broader reading that sees the as prohibiting all forms of lying. This is not entirely unreasonable, and most people will agree that lying is wrong, but at the same time most people will also agree that there can be circumstances in which lying is the appropriate or even necessary thing to do. That, however, would not be allowed by the Ninth Commandment because it is phrased in an absolute manner that does not permit exceptions, no matter what the circumstances or consequences. At the same time, though, it would be much more difficult to come up with situations in which it is not only acceptable, but perhaps even preferable, to lie while in a court of law, and this would make the absolute wording of the commandment less of a problem. Thus, it would seem as though a restricted reading of the Ninth Commandment could be more justified than a broader reading because it would be impossible and perhaps unwise to actually try to follow a broader one. Some Christians have tried to expand the scope of this commandment to include even more than the broad reading above. They have, for example, argued that behavior like gossiping and boasting qualify as bearing false witness against their neighbor. Prohibitions against such acts might be fair, but it is difficult to see how they can reasonably fall under this commandment. Gossip may be against ones neighbor, but if it's true then it can hardly be false. Boasting might be false, but in most circumstances it wouldn't be against ones neighbor. Such attempts to broaden the definition of "false witness" look like attempts to impose absolute bans on undesirable behavior without having to make the effort to truly justify such bans. The Ten Commandments have a "stamp of approval" from God, after all, so expanding what a commandment covers may seem like a more attractive and effective approach than banning behavior with mere "man made" laws and rules.